I should be in a panic getting ready for the first craft fair of this holiday season. But I'm not. Granted, I have been working steadily away at my jewellery, so I've got my base inventory just about ready. And I have been working on several exciting one-of-a-kind pieces. They are the ones I enjoy the most. And as there is an endless number of ideas for them, there will never be enough time! It also helps that I've done these fairs before, so I know relatively well what to expect. This has assuaged my guilt therefore, in taking time away from my bench to do some short workshops in topics entirely unrelated to jewellery making. I freely admit, I am a workshop junkie. I find endless fascination in learning new techniques. Especially traditional skills. I'm passionate about the preservation of old knowledge. Every workshop I do gives me new ideas for working in other materials too. I'm finding that Craft is so much more than a fulfilling (albeit hardscrabble) way to "make a living". Coming to an acceptance of just how much I enjoy learning new skills has broadened my perspective and my purpose from simply "making a living", to "making a life". See how much more inclusive that is? I like it a lot. Pillow-top weaving frame with "bake-apple blossom colour scheme. Historical samples in the background. 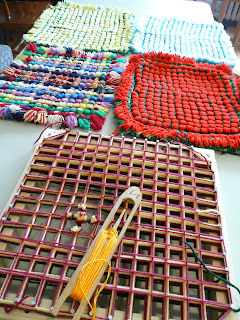 This past weekend I took a pillow-top workshop put on by the Heritage Foundation. This is a textile technique that was practiced by the men in the lumber camps on Sundays, when they couldn't work for religious reasons, as a token to bring home to their wives. 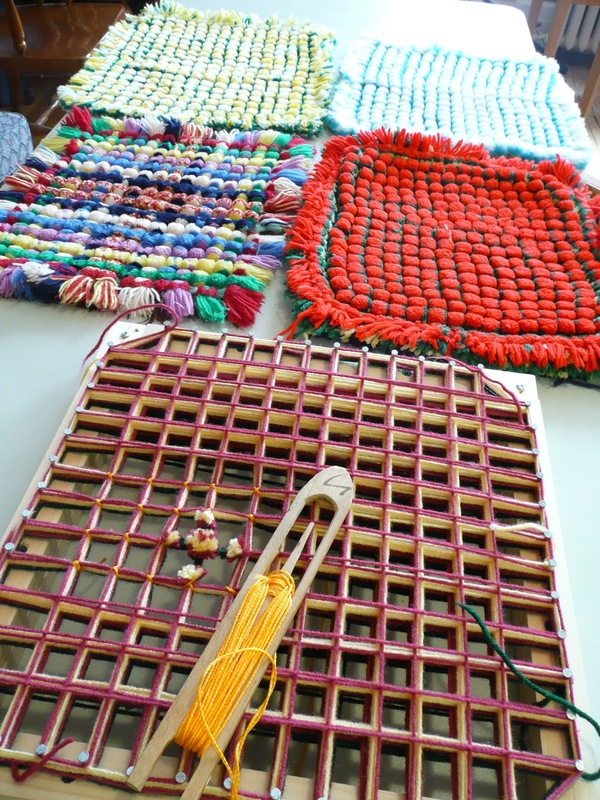 (You can read more about it here on the Intangible Cultural Heritage blog) If you have any historical knowledge about the practice of pillow top making, I'm sure they'd be glad to hear from you. Bowl, Jay Kimball. With "chattering" technique. I also took a workshop at the Clay Studio. This was taught by Jay Kimball, on the topic of texturing on the wheel. It has been ages since I sat down at the wheel, but winter is coming, and that should bring a lull. (I think! Although I remember thinking the same thing last year, and it did not happen.) 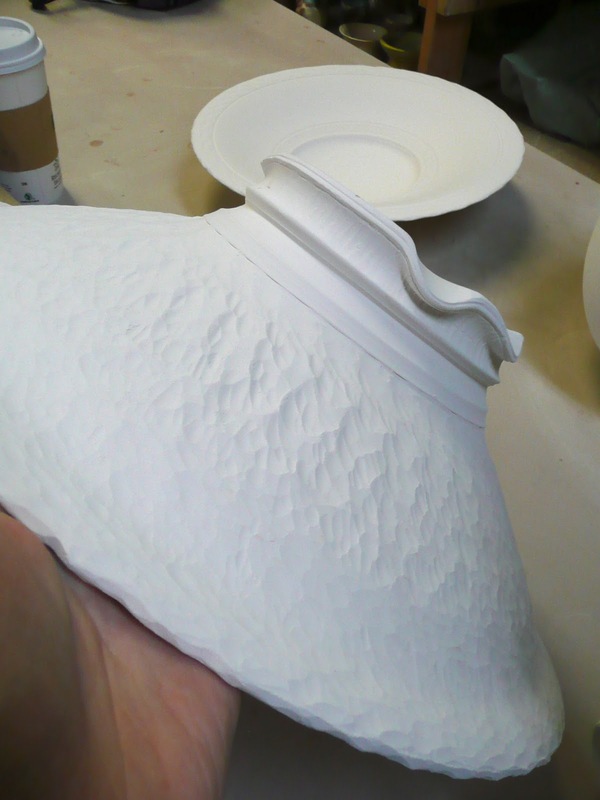 Jay packed two hours full with interesting new ways to embellish wheel thrown forms. Shown above and at right are the process, and the result, of what he calls a "chattered" texture. Lovely! But the holiday season is coming up and so I will be selling my jewellery at a few different locales over the next number of weeks. Making a living is a vital component of my efforts at making a life, as it is for so many craftspeople. So consider yourself officially invited onto the "support small business" bandwagon! As an appetizer before you board, here's a couple teaser shots of what I've be working on recently. Much more is waiting for a sunny day to be photographed. At left is a peek at one of my submissions the the annual Comfort & Joy exhibition at the Craft Council Gallery. Don't miss the open house on November 24th, 1-4pm! 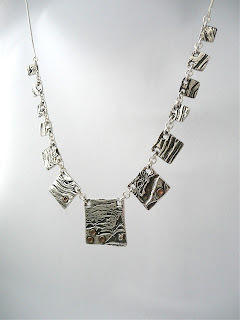 Below is a shot of the necklace I made using the texture from a cabbage. Yes. A cabbage. 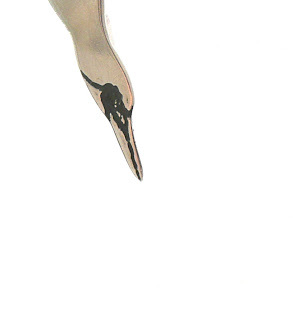 It's made of fine silver, sterling, and bronze. 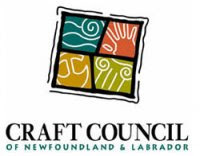 St. John's Arts & Culture Centre, My booth will again be on the first floor, near the doors to the children's library. Booth #114. My booth will probably be on the second floor, as it was last year. Below are a selection of other fabulously talented local artists and craftspeople who's work may be just the thing for someone on your Christmas list. Check out their blogs too why don't you?